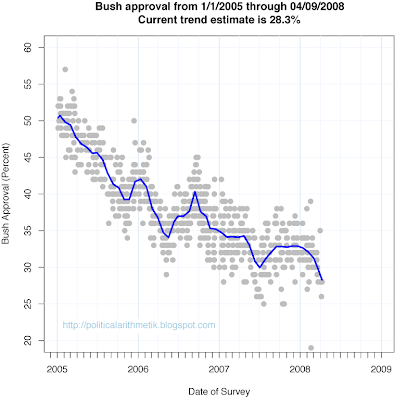 President Bush's approval trend has taken a sharp downturn in recent weeks, to fall to a new low for the administration at 28.3%. This follows a lengthy period of stable approval at around 32-33%. Recent polls from Gallup and AP/Ipsos put approval at 28%, a new low for the Gallup poll. Harris recently found approval at 26% while CBS News put approval at 28%. Pew similarly has approval at 28%, though the Diageo/Hotline result for registered voters (as opposed to adults in the other polls) has approval at 35%, the only recent poll over 30%. While the President has taken a back seat to the primaries in recent months, his new approval slump reflects growing pessimism over the economy which has displaced the war in Iraq as the most important problem facing the country. Likewise the percent saying the nation is headed in the wrong direction has continued to grow in recent months, to a high of 81% in a recent CBS News poll.